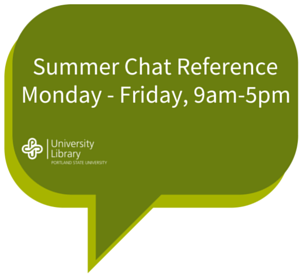 This summer, PSU Library is transitioning to a new online chat reference service. As we work to implement the new system, we will temporarily reduce the hours our chat reference services are available. Beginning July 1, our chat service hours will be Monday through Friday, 9:00 a.m. to 5:00 p.m.
After 5:00 p.m. and on weekends, please email us your questions, and we will respond the next business day. 24/7 chat service will return for fall term. Would you like more information? Please ask a librarian.